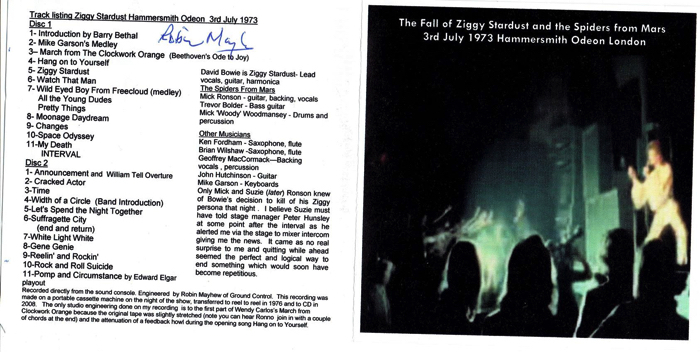 Robin Mayhew who was the sound mixer on the Ziggy Stardust tour has released his version of the famous last Ziggy concert. The recording is complete including Jeff Beck and is straight from the soundboard. 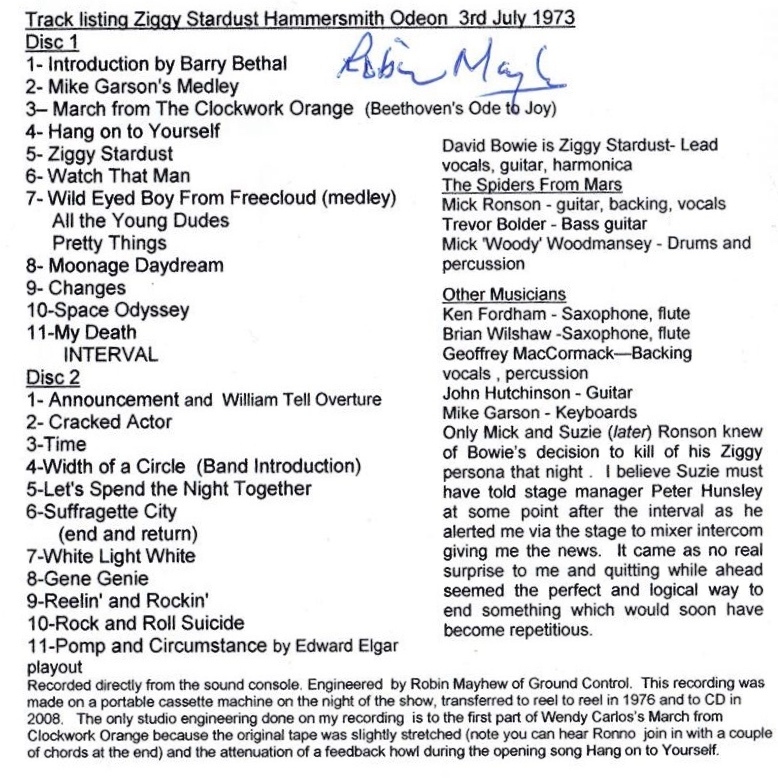 Robin Mayhew do hope you enjoy what was heard that momentous night in London in July 1973. 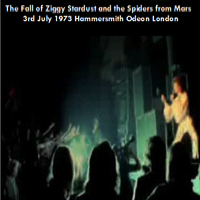 The 3rd Ziggy Stardust UK tour finishes at the Hammersmith Odeon Theatre, London. This concert comes to be known as the “Retirement Gig.” Jeff Beck attends as special guest. Before this gig Bowie had announced that he would take a short holiday when the tour was over, before recording at the Chateau in France and then planned to return to the US for another tour. Robin Mayhew is selling selfmade CDRs for £10 (UK) and £15 (International) at his website. 20% goes to charity. 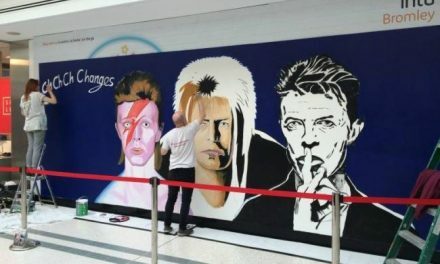 Bowie’s announcement is also a major shock for The Spiders From Mars who were unaware that Bowie had also decided to retire them from ever touring again. 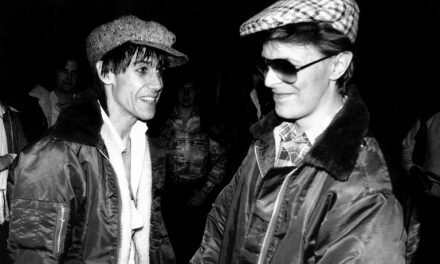 Only Tony DeFries and Mick Rock were aware of the announcement. 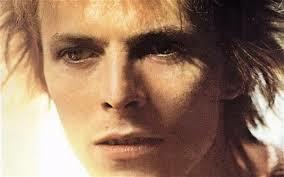 That night Bowie and a handful of friends hold a small party at the Inn On the Park.. Please – if you ever visit You Tube have a listen to one of my songs which will be a bonus track on my forthcoming album Shallow and Deeper. The song is called Together (A Song for Isobel) sung by Charlotte Howard. If you are a parent or perhaps a grandparent you may enjoy the sentiment. Please spread the word. Simply search with my name in YouTube and you will find it.